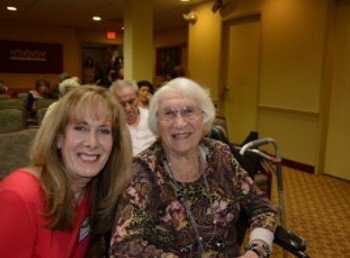 At The Peninsula, the assisted living and memory care community in Hollywood, the month of February was filled with new experiences, outings, entertainment, and signs of spring were certainly in the air. We had a new entertainer, “Lou Laino” as a headliner. He captivated the audience with his Frankie Valli repertoire of songs such as “My Eyes Adored You” and “Can’t Take My Eyes off of You.” Everyone enjoyed his upbeat style. “Filippi” was also on hand during the month. His sultry voice of romantic ballads seemed fitting for the love month of February. On Valentine’s Day, festivities made all of our residents feel the ‘love’ at The Peninsula. We had a party with entertainer “Myles Sockin” and he had everyone moving and grooving to a variety of his music. A delicious Valentine’s Day cake was served. Girl Scout troop #10101 also came to sing and read stories to residents. Peninsula resident, Gloria Humes, captivated the children, residents and guests when she read a book aloud. The children gathered around her and it was simply charming. For employees at The Peninsula, we had a special treat when Heartland brought us lunch to show their appreciation. We certainly felt the love of February. They also did a special program for residents. We had a music therapist (singer and guitar player) who played those forever classic sing-a-long tunes. Everyone joined in singing and enjoying the scrumptious Valentine’s cupcakes they brought. Our outings this month took residents to some of their favorite local spots, “Red Lobster” and “Rustic Inn.” These delicious seafood restaurants were especially popular and residents enjoyed the change of pace. One of our weekly programs was “Poems of Adoration and Affection.” Poems of love were shared and a resident read a poem she wrote. Everyone complimented her writing abilities. These poetry sessions are very sentimental and touching. Poems are wonderful ways of honoring our older generation and promoting a positive outlook towards aging. Our memory support “Garden” residents also enjoyed Valentine’s Day. They decorated Valentine’s cookies and later ate their creations. February ended with a rousing PO-KE-NO game night. Appropriate for the love month, residents received candy hearts for each game they won.